dFakto is proud to announce a new partnership with Nixxis regarding GDPR compliance. Nixxis’s advanced Contact Suite is a visionary and flexible solution that has been designed anticipating all future needs of contact centers in terms of customer interactions (phone, email, chat, sms, social networks). 80% of Nixxis’s customers report up to 20% increase in productivity and profitability. By promoting dFakto’s GDPR 360 application suite, Nixxis is probably one of the first that brings GDPR compliancy as a competitive advantage ! GDPR concern worldwide business which handle private data on EU citizen. While you are a Data “Controller” or “Processor” you now have obligations and rights towards Data subjects and Authorities. As a Data Processor, Nixxis needs to be aligned to its customers obligations as Data Controller and therefore has decided to implement dFakto GDPR 360 to manage the day to day operations maintaining GDPR compliance. A Data Processor may only operate on behalve and according to the Data Controller’s instructions. The Data Processor may suggest processes improvements and data quality checks regarding GDPR compliancy but may not implement them without the approval of its Data Controller. When facing GDPR, most organizations are focusing on the assessment rather than on the GDPR implementation & operations. Those organisations are supported by Law firms for their legal framework, Security firms for their security frameworks and/or GDPR consultants to produce DPIA’s (Data Protection Impact Analysis). Where are you in your process to be GDPR compliant? Is your assessment done? Have you already set up an operational solution to manage your daily actions once GDPR is in application? Regulations come into effect in less than 3 months or 80 days from now! After that, the full force of the law comes into effect. Before May 25, 2018 performing an impact assessment was adequate, but after this date, every bit of Personally Identifiable Information (PII) across the business must be accounted for and managed, to avoid very real fines. This is a game changer. It is no longer adequate to simply have ‘accounting-like’ procedures in place – the actual PII data must be managed and the business is accountable for it directly. GDPR is fundamentally a highly evolutive data management challenge. The GDPR solution requires an agile data approach. 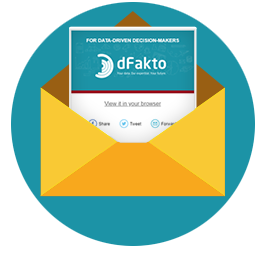 Turn the GDPR obligation into an opportunity and a competitive advantage with dFakto’s GDPR 360 ! With more than 17 years of experience, dFakto is a company that specialises in sourcing and collating data so that senior managers can more easily identify actionable insights to drive their business forward. Discover dFakto’s GDPR 360 operational solution to effectively manage daily activities and stay secure regarding risks and costs exposure. dFakto provides with the best agile GDPR 360 solution and services available on the market. It will tackle this impactful legal obligation in an innovative, cost effective, incremental and sustainable way. Our innovative GDPR 360 solution addresses the GDPR post-assessment implementation & operational challenges. GDPR is coming fast now. Are you ready ? dFakto ecosystem provides a complete GDPR value chain from assessment, implementation to daily operations to maintain compliance. Visit our website, download our white paper or contact us to get a demo and a GDPR 360 pricing. dFakto “GDPR360” solution drives the operational implementation of the GDPR. What’s after the GDPR Assessment?